Happiness and Longer Commutes - What&#39;s the Relationship? Happiness and Longer Commutes - What's the Relationship? Did you know that moving into a posh neighborhood would be even more harmful to your happiness if it means a longer commute. In a study conducted at the University of California at Irvine, researchers found that driving alone under stressful conditions can actually cause or contribute to high blood pressure or stroke. According to this study, a long commute (more than 18 miles one way) may increase the likelihood that you will have a heart attack. 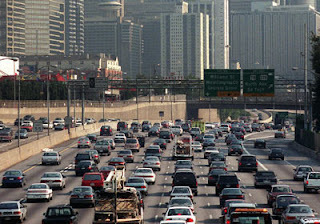 It's not only the stress involved that can increase your heart rate and blood pressure, but also the exposure of commuters to high levels of air pollutants, which appears to be a risk factor for heart disease. People Commuting To: Home Depot, United Parcel Service, Coca-Cola, Delta Air Lines.